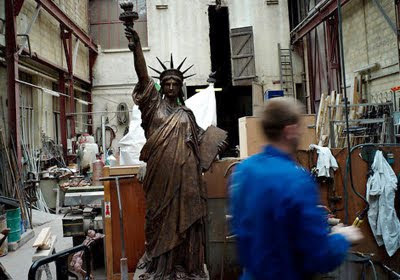 For just $1.1 million, you can own a replica of the Statue of Liberty. Already have one you say? Not this replica. For this lofty price you get a replica made from the original plaster sculpture that Frédéric-Auguste Bartholdi used to create the Statue of Liberty. Standing roughly nine feet tall instead of 151 feet tall for the lady in the harbor. The plaster model is from the Musée des Arts et Métiers in Paris where It has been since Bartholdi’s widow bequeathed it in 1907. But now, as reported by the New York Times, a French art dealer has been able to scan the delicate lady without harm and produce a limited number of bronze casts. Two have been sold already.